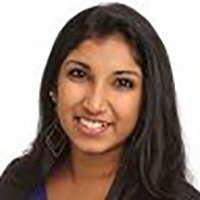 Manisha Samy is an Analyst at ARK Investment Management LLC. Ms. Samy joined ARK as a thematic analyst on the Genomic Revolution team in February 2016. Her focus is on gene editing, gene therapy, instrumentation, targeted therapeutics, agricultural biology, diagnostics and stem cells. Prior to ARK, Ms. Samy worked as a management consultant for Kepler Cannon. Before that, she gained experience as a business solution analyst at Attensity America. Ms. Samy graduated from Stanford with a Bachelor of Science in science, technology and society: life sciences and biotechnology. She has spent eight years in Stanford’s research lab studying stem cells in acute myeloid leukemia. “…Whenever we do trades as we release all of our trades at the end of the day so people can see exactly what we’re buying or selling. Often, since we are actively managed, even if we do have high conviction, let’s say a stock has soared quite a bit, we will take the profits and invest in companies that have been hit. The mismatch between target market size and current valuations drives Ms. Samy’s core picks. “…For Editas, Intellia and CRISPR Therapeutics, right now, combined, they struggle to maintain $4 billion in market capitalization. But, based on our research, we think just addressing monogenic diseases is a $75 billion market opportunity. Read the entire 3,640 word interview, exclusively in the Wall Street Transcript, and get all the top gene therapy stock picks.